M Murciano Martínez, C González Saavedra (2018): “The cultural and creative industries in the Spanish regions: The case of Catalonia”. Revista Latina de Comunicación Social, 73, pp. 146 to 167. [ES] Las Industrias Culturales y Creativas (ICC) forman un ecosistema que puede beneficiarse de entornos socioeconómicos favorables y de las oportunidades abiertas por el cambio tecnológico. El presente artículo constata la existencia de correlaciones entre los indicadores que permiten contextualizar las actividades creativas y culturales en el marco autonómico español, en general, y en Cataluña en particular. El PIB per cápita y el nivel de formación se retroalimentan positivamente; la educación se asocia a una menor tasa de riesgo de pobreza y a un elevado índice de oportunidades, infraestructuras y usos digitales; y la disponibilidad y manejo intensivo de las tecnologías de la información y las comunicaciones (TIC) es inherente a un mayor consumo cultural y al disfrute de unas condiciones económicas favorables. La metodología utilizada para el análisis muestra por primera vez el peso desagregado de las ICC en Cataluña, y su relación con el resto de las comunidades autónomas de España. [EN] Cultural and Creative Industries (ICC) form an ecosystem that benefits from both favorable socio-economic environments and the opportunities opened by the technological change. This article establishes the existence of correlations between the indicators that allow contextualizing creative activities in the framework of Spanish regions, in general, and of Catalonia in particular. 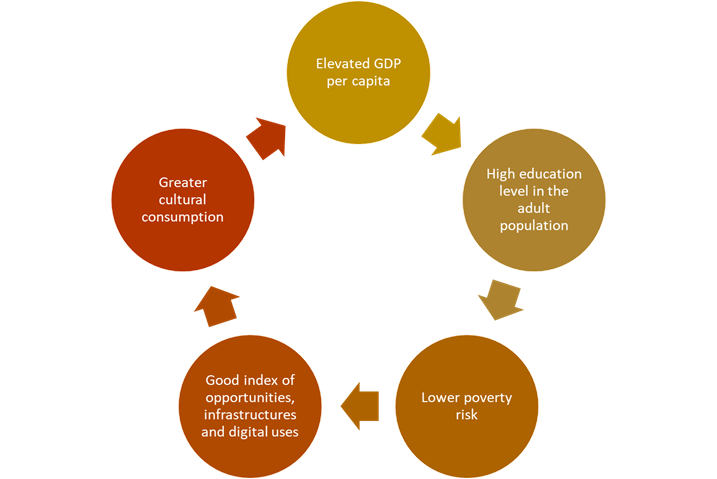 GDP per capita and education level feedback each other positively; education is associated to lower risks of poverty and high rates of opportunities, infrastructures and digital uses; and the availability and intensive management of information and communication technologies (ICT) is inherent to greater cultural consumption and the enjoyment of favorable economic conditions. The methodology used in the present analysis shows for the first time the disaggregated weight of CCI in Catalonia, and its relationship with the rest of the Spanish regions. [ES] Industrias culturales y creativas; CCAA España; cartografía cultural; crecimiento económico; empleo; competitividad. [EN] Cultural and creative industries; Spanish regions; cultural cartography; economic growth; employment; competitiveness. [ES] 1. Introducción. 1.1 El contexto de las ICC en Cataluña. 1.2 Inversión pública y consumo cultural. 1.3 Oportunidades, infraestructuras y usos digitales: Modelo Localcom. 2. Metodología. 3. Resultados. 3.1 El peso de los SCC en la CCAA en el contexto español: modelo MELICC. 3.2 Empleo SCC. 3.3 Empresas SCC. 3.4 Resultados económicos. 3.5. El atractivo de los SCC en Cataluña: políticas y actuaciones. 4. Conclusiones. 5. Notas. 6. Referencias bibliográficas. [EN] 1. Introduction. 1.1 The context of CCIs in Catalonia. 1.2 Public investment and cultural consumption. 1.3 Opportunities, infrastructures and digital uses: Localcom Model. 2. Methodology. 3. Results. 3.1 The weight of the CCS in the Spanish context: MELICC model. 3.2 Employment in CCS. 3.3 CCS Companies. 3.4 Economic results. 3.5. The attractiveness of CCS in Catalonia: policies and actions. 4. Conclusions. 5. Notes. 6. List of References. This article is part of the research project “The transformation of cultural and creative industries in Spain: digital change, competitiveness, employment and contribution to the social wellbeing in the Horizon of 2020”, funded by the Ministry of Economy and Competitiveness, which main objective is to contribute with a new approach to the study of cultural and creative industries (CCI) in Spain, identifying, through a harmonized and internationally comparable methodology, how they have evolved in the current context of digital change and to what extent they contribute to the generation of employment and social wellbeing (Murciano and González Saavedra, 2017a). The proposed approach to study CCIs, also known in the European literature as Cultural and Creative Sectors (CCS) (KEA, 2015: 5), considers three essential aspects: firstly, the need to provide knowledge and analysis from the perspective of regional spaces, understood in a juridical and constitutional manner in our country as Autonomic territories or Autonomies; secondly, the correlation of CCIs with the social wellbeing through the study of quantitative variables (employment, companies and economic results) and the development of a model of our own (Statistical Localcom Model of Cultural and Creative Industries, MELICC) (Murciano and González Saavedra, 2017b); and thirdly, the opportunity to measure impact and the possibilities, for the analyzed sector, opened by the innovations associated to the transition to digital environments (Localcom Index) (Murciano and González Saavedra, 2017c). Cultural and Creative Sectors (CCS) form a dynamic ecosystem in Catalonia where tractor fields coexist and feedback on each other, consolidates, with activities of distributed dynamics, that benefit from a relatively favorable socioeconomic environment in the Spanish context and of opportunities opened due to technological change. In a global scenario marked by the imprint of communications, it is important to have available, at local scale, the installed capacity and human resources fit for the creation of traditional cultural assets, but it is also essential that creators also have the necessary conditions to allow the transition to the interconnected environment of networks or to new forms of consumption. These capacities, resources and conditions comprise the socioeconomic context of CCS and explain, to an extent, its implantation on territories. This research confirms the existence of reciprocal relationships (correlations) between some fundamental indicators to contextualize creative activities in the Spanish Autonomic Framework, in general, and in Catalonia in particular. GDP per capita and the high education level in adult population feedback each other positively; education is also associated to a lower poverty risk rate and an elevated index of opportunities, infrastructures and digital uses; and this availability and intensive management of information and communication technologies (CIT) is inherent to a greater cultural consumption and the enjoyment of favorable economic conditions. With a population of 7.5 million inhabitants (2015), Catalonia is the fourth autonomous community in GDP per capita (27.613 €) in Spain, has the third lowest poverty rate (13.9%), and it is the seventh one in percentage of adult population with a high education level (37.5%). Besides, its inhabitants generate an average cultural consumption of 326 € per capita, the second highest one of Spain (2014) and occupies the third place in the Localcom Index that measures the opportunities, infrastructures and digital uses. This context data show the presence of capacities, resources and conditions suitable for the implantation of cultural and creative activities in the autonomous community, but also to identify improvement areas. The educational level of the adult population is specially significant that, even though it has increased almost eight points since 2008, still maintains Catalonia far from territorial leaders in this matter. Even though the educational level (completing successfully the first or second cycle of superior level education of a doctorate) is a variable than strongly influences in the cultural consumption patterns, for instance, in reading or attending cinema (Eurostat, 2016: 120-129), university education also plays a relevant role in the development of CCIs because it favors the employability and boosts work force specialization. Therefore, it is useful to observe the data of university students registered in fields directly related with CCS: architecture, urbanism, music and performing arts, fine arts, design, audiovisual communication, biblioteconomy, documentation, languages, journalism, marketing and advertisement. In Catalonia, during the course 2013-2014, about one of every six university students was registered in a culture related field, which is equivalent to 31.000 students, almost three times more than the Spanish average (MECD, 2016). The public investment on culture is another one of indicators used for contextualizing the weight and situation of CCS in the autonomous communities. It is about a significative value because it can work as sector catalyzer: statistics developed by the MELICC model demonstrate that, the greater public investment on culture, there is greater increase of numbers of companies in CCS. Autonomic administration, local governments and councils destine to culture, a number that represents 0.4% of Catalan GDP, about 107 Euros per capita (2014). Compared to the numbers of 2008 (0.5% and 148€), it is evident how crisis has contributed to reduce culture budgets, but even so, Catalonia still maintains itself as the autonomous community that more public resources destines to the sector, in absolute terms: 805 million Euros. Crisis has also affected the consumption of creative goods by citizens. If in 2008 the average cultural consumption in Catalonia was 452 € per capita and each home dedicated 3.4% of its total expenses to cultural goods and services, in 2014 these numbers reduce to 326€, 2.7%, respectively. However, Catalonia maintains as the second autonomous community in both indicators (MECD, 2016). 1.3. Opportunities, infrastructures and digital uses: Localcom Model. As aforesaid, it is possible to stablish a reciprocal relationship between cultural consumption and availability and use of information and communication technologies. In this sense, it is helpful to use the results of the Localcom index as reference, which measures the main socioeconomic, technological factors and consumptions patters associated to the display of Information Society, and that positions Catalonia in the third position among all Spanish autonomous communities (Murciano and González Saavedra, 2017c). With 0.651 points (over a maximum of 1), Catalonia is positioned third in the autonomic ranking, after the Basque Country (0.808) and the Community of Madrid (0.793), surpassing in 32% the Spanish average. Catalonia’s behavior in the three subcategories that comprise the index is quite uneven: it is positioned third in the general classification in advanced uses of networks (0.731), the fourth place in the opportunities section (where the economic and educational resources grounding the implantation of ICTs are considered) with 0.673 points, and lowers to the seventh place in infrastructures display (0.549). The results obtained by Catalonia confirm that the structure in levels of the model (opportunities-infrastructures-uses) is not necessarily sequential or determinist and that it may be conditioned by the greater or lesser weight of resources and the sector’s actions in the autonomous communities. Therefore, it is significant that electronic uses are the ones allowing Catalonia to improve its total score, since it is a useful category to explain the transformation of creative sectors in terms of digital change and new patterns of access and cultural participation. The transition to the digital environment has direct effects in the way cultural goods and services are created, disseminated, consumed and made economically profitable, and in the way there is access to them. As the European Parliament highlights, changes derived from the transition to digital environment offer a wide range of opportunities for the cultural and creative European sectors because, together with lower distributions expenses, new commercialization channels, and new and greater potential audiences, there can be easier access and increase the circulation of cultural and creative works in the whole world (European Parliament, 2013: article 13). Some political actions promoted in Catalonia, like the digital culture Plan for Catalan creative companies 2014-2016 (Department of Culture, 2014), precisely look to improve competitiveness and the employment of cultural and creative companies through the promotion of ICTs and the tools characteristic from the digital world. The lines of action of this plan are stablished according to the recipient: digital native companies (initiatives of support to funding, internationalization, visibility, creation of business opportunities and headhunting), and traditional cultural companies (adaptation of the funding system, promotion of creation of digital products, boost of transmedia projects). Also, transversal actions are considered, like initiatives of University-Company transferal, intersectoral cooperation, education and consultantship. If, as evidenced in the Localcom Index, Catalonia has comparative advantages regarding social use of electronic technologies, cultural and creative sectors settled in the autonomous community will also be in disposition to incorporate, for their own benefit, the consequences of this dynamic, as long as they outstand in the other two complementary levels: infrastructures and opportunities. In such a way, to adapt to the to the context marked by transition to the digital environment and internationalization, the Catalan companies of the cultural and creative sector must be able to act simultaneously on three levels: the new mechanisms of access, consumption and profitability of goods and cultural and creative services (uses); modernization of necessary facilities to develop the creator’s activity (infrastructures); and the development of new competencies, production and distribution methods, improvements in funding access and adaptation of their business models (opportunities). The methodology of this paper has been developed by the Localcom Research Group (Murciano and González Saavedra, 2017b). The statistical reference used is the Annual Survey on Services (EAS), elaborated by the National Statistics Institute (INE, 2008-2014), which offers data at national level. However, for some CNAE categories (National Classification of Economic Activities) this source does not offer data disaggregated by autonomy, due to limitations of the sample used, and only incorporates two digit references, which generates distortions in some of the analyzed CCIs categories. On the other hand, for the Performing Arts and Libraries, museums and patrimony subcategories, data provided by a INE-UAB agreement are not disaggregated by autonomous communities. Considering these limitations, it was necessary to develop our own statistical model, which consists in adjusting the original statistics provided by INE and stablish the missing data through a value re-assignment method. This procedure was carried out under the specialized performance of the Service of Applied Statistic, by Universidad Autónoma de Barcelona, which has offered statistic rigor in results. The resulting proposal is the Localcom Statistical Model of Cultural and Creative Industries (MELICC), which main results are presented in this paper. 3.1. The weight of the CCS in the Spanish context: MELICC model. To dimension the economic and social impact of CCS in Spain’s autonomous communities, according to the Localcom Statistical Model of Cultural and Creative Industries (MELICC), we used four basic variables of the international bibliography of reference in the sector: cultural and creative employment; business activity; business volume; and the gross value added (UNESCO, 2012: 89). Employment: cultural and creative sectors employ 87.998 individuals, 3% of the total occupation of the autonomous community. Companies: 31.611 companies operate in the field of CCS, that is, there are 42 companies of the sector by every 10 thousand inhabitants. Business volume: cultural and creative sector generates a conjoint business volume superior to seven thousand million Euros annually, which represents 3.7% of the Catalan GDP  and 9.4% of the business volume of the services’ sector. Gross value added: The gross value added of CCS is 2.952 million Euros, which represents 1.5% of the autonomous community’s GDP. When observing the relative distribution of these data in Spain as a whole, we observe that Catalonia is positioned in the second place in all study variables, only surpassed by the Community of Madrid (Rodríguez Gómez, Real and Rosique, 2017: 295-320). It is a consolidated position because it maintains in similar terms in the study period (2008-2014). In each one of the four variables, Catalonia concentrates about a fifth part of the value corresponding to all autonomous communities: it represents 22.1% of employment, 21.1% of total of companies in CCS, 22.4% of business volume and 22.3% of the gross value added. Madrid and Catalonia are the only autonomous communities with more than 30.000 cultural and creative companies each, summing up 44.4% of the total of Spain’s cultural entities. This evidences a strong imbalance in the implantation of these sectors in the national territory (17 autonomous communities). But despite having a similar number of companies in CCS, Catalonia contributes to the State with half the business volume of the Community of Madrid (22.4% versus 54.3%). The lower average size of Catalan cultural companies (2.8 employed individuals, compared to 4.1 in Madrid) explains the fact that they represent a lesser participation in the total business volume. By cultural and creative subsectors, Catalonia only has the Spanish leadership in visual arts (design, artistic and literary creation and photography), where it leads the four study variables considered. In either case, it is an activity of reduced sector weight, because it represents 6% of the business volume of Spain’s CCS and a tenth part of the total employment. In audiovisual and multimedia, the category that generates a greater business volume in the Spanish scenario of CCS (28.2% out of the total), the 2.194 Catalan companies occupy a fifth part of the sub-sector’s employees (half compared to Madrid, first in ranking and double compared to Andalusia, the third one). The capacity of income generation of these companies is four times inferior in Catalonia compared to Madrid and six times superior to Andalusia. Consequently, it is evident that not only the number of the audiovisual and multimedia companies, but also their size, condition the benefits they offer and determines the most favorable scale economies. During the period studied (2008-2014), Catalonia’s audiovisual and multimedia subsector has increased its relative weight in Spain as a whole: the contributions to employment in this Branch has increased in four points, while its contribution to the State business increased two points in percentage. Another one of the large subsectors integrated in the field of culture and creativity is books and press: it represents 24.3% of the State business volume and 20.3% of employment. In this field, sufficiently led by the Community of Madrid and Catalonia (sum up more than two thirds of business and occupation compared to Spain), the distance between both territories is less considerable, mostly thinking about the number of companies (7.321 against 6.019) and business volume (3.731 million Euros against 2.186 million Euros). The contribution of the Catalan journalistic and editorial market to Spain in general has kept barely unaltered between 2008 and 2014: this represents a fourth part of companies and employment and almost a third of the business volume generated by all autonomous communities. Finally, advertisement constitutes the third great creative subsector because it generates 23.0% of CCS business and employs 20.8% of personnel. Again, Catalonia comes next after the Community of Madrid in the four variables considered (employment, companies, business volume and gross value added) and contributes in each one of them about a fifth part of the Spanish total. In short, within the Spanish system of territorial distribution of cultural and creative sectors, Catalonia is positioned second in an outstanding manner, relatively homogeneous compared to the rest of territorial stakeholders and sustained over time. According to results of the statistical model developed in the context of this research, cultural and creative sectors provide employment for 87.998 individuals in Catalonia, 2.9% of the total employment of the autonomous community . During the studied process, that comprises practices of severe general economic recession in Spain, a moderate but continuous decrease was observed in the number of individuals employed in cultural areas: in 2014 there were 18.758 less employees than 2008 (-18%), with a negative interannual compound growth rate of -3.2%. This trend also repeated in relative terms: the contribution of cultural employment to the total decreased from 3% to 2.9% in six years. Even though all autonomous communities have destroyed cultural employment during crisis at a greater speed than what economy in general did, in Catalonia, the gap between both negative rates (-3.2% for cultural employment, -2.7% for total employment) is, together with Madrid (-2.5% and -2.3%, respectively), the lowest of Spain. In other words, data demonstrate that both communities, leaders in cultural occupation, have a CCS that are less vulnerable to effects of crisis than the rest of autonomies. It is also appropriate to observe the weight of employment of CCS in relation to the services macro sector, which besides constituting a more enclosed framework of structural reference, it is the main engine of the Catalan economy, because it represents 68% of autonomic GDP. In this sense, CCS contributes with 9% of the total occupation of the services sector in Catalonia, that is, have an employing capacity inferior to very potent activities such as hotel business (23%) and transport (16%), but superior to Real Estate activity (5%). The distribution of employment in CCS by categories, evidences the weight of the three areas that, together, generate three out of five sector’s jobs in the autonomous community: advertisement, which contributes with 23.1% of occupation in CCS, editing (21.1%) and audiovisual (15.7%). After architecture (12.4%), it is positioned in the subsector of performing arts that, with a 11.6% of employment in CCS, demonstrates having a socio-labor impact very superior to its economic weight (5% of business volume of CCS). 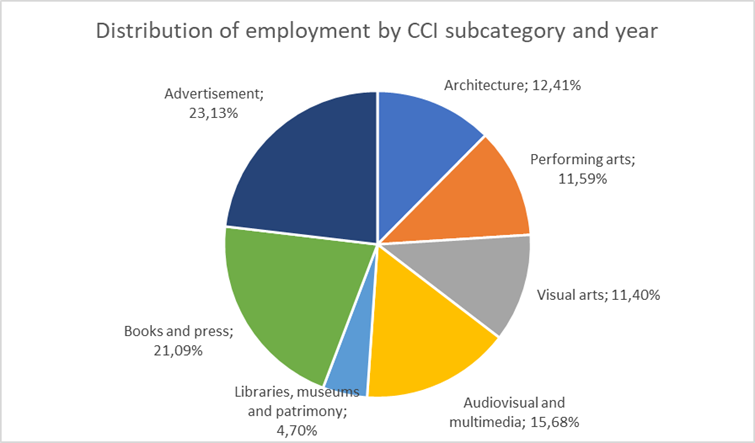 At the bottom of the list, there are visual arts and libraries, museums and patrimony, with 11.4% and 2.7% of employment in CCS, respectively. In order to compare the productivity of the work in cultural sectors, UNESCO recommends calculating the gross value added per employee in the different subsectors considered (UNESCO, 2012: 21). In Catalonia’s case, the result of this operation shows an average productivity of 33.543 Euros per employee. The most productive subsectors are again, the three that leader Catalan CCS: audiovisual and multimedia, with 39.410 Euros of added value per employee; advertisement, with 38.206 Euros; and books and press, with 38.069 Euros. 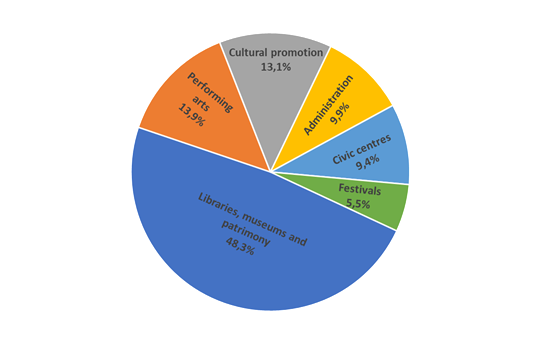 Under the average of the sector there are performing arts, architecture, visual arts and activities of libraries, museums and patrimony. On the other side, Eurostat uses another indicator when comparing the cultural employment with the capacity of the sector to generate income (Eurostat, 2016: p. 77). It is about the business volume per capita, that is, income by every employed person. From this perspective, CCS’s business volume per capita in Catalonia is about 83.241 Euros, superior to 79.603 Euros with services activities as average. Compared to other services, staff employed in creative and cultural fields, considered as a whole, generate a greater business volume than hotel business (47.518 Euros), but they are below transport activities (136.675 Euros) and Real Estate (100.628 Euros). However, the three subsectors that dominate employment in CCS, show a better performance in this indicator: audiovisual and multimedia, 121.113 Euros of business volume per employee, books and press, 117.812 Euros; and advertisement, 86.322 Euros. As aforesaid, crisis has comprised the destruction of more than eighteen thousand cultural and creative workplaces in Catalonia between 2008 and 2014. In this period, the only activities that have dodged this trend are advertisement and libraries, museums and patrimony: together they have summed up more than three thousand six hundred job positions to the sector. In contrast, for two of the most potent activities of CCS in Catalonia, books and press and audiovisual, crisis has entailed annual averages of employment regression of 5.3% and 2.1%, respectively. In these six years, negative rates of employment in visual arts have been averaged as well (-4.5% of annual mean), performing arts (-2.2%) and architecture (-9.5%), specially affected by the drop of the Real Estate sector. In Catalonia, there operate 31.611 companies oriented towards the fields of cultural and creative sectors, which represents 42 companies by every 10 thousand inhabitants . It is about a meaningful number because it corresponds to 12.7% of all autonomic companies of the services sector. Two out of ten CCS Spanish companies are settled in Catalonia. 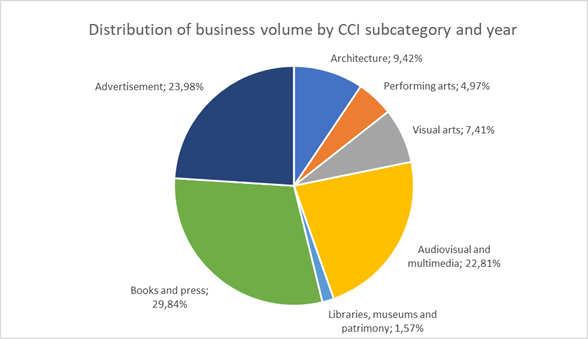 Architecture is the activity grouping a greater number of companies in CCS, 24.5%, followed by visual arts (23.4%), books and press (19%), advertisement (15%), audiovisual and multimedia (6.9%), performing arts (6.6%) and libraries, museums and patrimony (4.6%). If the magnitudes of cultural employment are considered, it is deduced that CCS companies are mainly SMEs (micro-companies, small and medium size companies): they employ an average of 2.8 individuals, way below the average of the services sector (4.0). But when considering cultural and creative subsectors individually, relevant differences are appreciated in corporative dimensions: for instance, audiovisual and multimedia companies employ, as average, almost four times more individuals than architecture (6.3 against 1.4). In the field of culture and creativity, companies’ size specially conditions their performance and feasibility. Regarding this issue, the European Union highlights that one of the greatest challenges SMEs face in this sector, is the difficulty they have to access necessary funds to finance their activities, grow and maintain and increase their competitiveness or internationalize their activities. Although it is a common challenge for SMEs in general, “the situation is much more difficult in the cultural and creative sectors, due to the intangible character of many of its assets, due to the fact that their activities consist in the elaboration of prototypes and their intrinsic need to take risks and experiment in order to innovate” (European Parliament, 2013: art.17). As proof of the hurdles faced by SMEs of the sector, it is confirmed that the economic crisis led to the closure of 6.472 CCS Catalan companies between 2008 and 2014: one of each six operative companies at the start of the period, was not operative any more at the end of it. The compound rate of interannual variation during that time has been negative for four subsectors: architecture (-7.5%), audiovisual (-4.6%), books and press (-4.2%) and visual arts (-3.1%); while three activities have keep the contrary behavior, that is, they have summed new entities: advertisement (1.9%), performing arts (5.2%) and libraries, museums and patrimony (29.2%) . The total balance is, in either case, negative, because while in average four cultural companies closed per day during the six year period, barely one was created. When observing the absolute values, the effects of crisis are evidenced even more regarding subsectors in deficit: architecture, directly affected by the crash of the real estate bubble, looses 4.613 companies, 37.3% compared to those at the start of the period; in books and press 1.781 companies disappear (-22.8%); in visual arts 1.548 companies close (-17.3%); and in audiovisual, 710 companies (-24.4%). 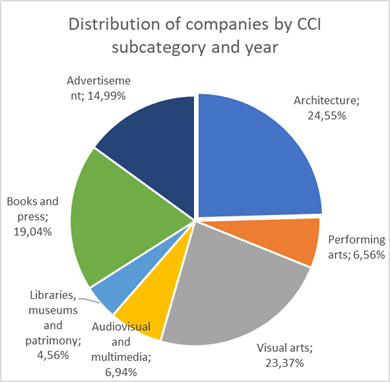 In contrast, new CCI companies have been created in the field of advertisement (509), performing arts (540) and in libraries, museums and patrimony (1.131) . As a consequence of the regression in the total number of CCS companies, the relative weight within the Catalan business fabric has been affected as well: if, as has been evidenced, in 2008 cultural and creative companies represented 14.5% of all entities of the services sector of Catalonia, in 2014 this value was becoming 12.7%. In relative terms to Catalonia population, the number of CCS companies by every 10 thousand inhabitants has moved from 51.7 in 2008 to 42.0 in 2014, that is, there has been a reduction of 18.8%. As demonstrated in the statistical model developed by this project, there is a strong correlation between the richness per capita of the autonomous communities and the density of CCS companies. Although Catalonia has lost terrain in this indicator, the also negative trend of the rest of territories allows it to maintain itself, together with the Community of Madrid and Basque Country within the leading cluster. The business volume, which reveals the sales of cultural goods and services or income the sector is able to generate, is an adequate indicator for stablishing the economic dimension of activities grouped in this area and, at the same time, it provides information about the impact of financial crisis that impacted Spain, and the world economy as a whole, since 2008. In general, recession had negative effects in the business volume of CCS in Spain overall: between 2008 and 2014 the compound rate of annual growth of all autonomous communities represented an average of -9.0%. At the end of this period, no autonomous community could be able to go back to yielding levels reached back on 2008. In Catalonia, the regression of -4.1%, maintained below average. But, as evidence of crisis, we notice that income reduced at a greater speed than the drop speed of the sector’s employments (-3.2%) or the number of companies (-3.1%). In other words, cultural and creative companies are able to support the effects of recession and keep employment levels despite their income reduction. This income reduction has been more accelerated in the creative and cultural fields compared to the services sector as a whole: the sustained reduction in CCS income between 2008 and 2014, of -4.1%, contrasts with the business volume of the services sector, that only averaged, in the same period, a 1.0% of annual regression. In 2014 the business volume of CCS in Catalonia was 7.325 million Euros, a number that represents 9.4% of the total business volume of the services sector. Three cultural and creative activities sum almost 80% of the business volume in this field: books and press (2.186 million Euros), advertisement (1.757 million Euros) and audiovisual and multimedia (1.671 million Euros). These same activities, although ordered differently, are also the ones generating a greater number of job positions: advertisement (20.354), books and press (18.555) and audiovisual and multimedia (13.797). Books and press editing is the leader activity of the cultural and creative sectors in Catalonia: it generates almost a third of the total business volume (29.8%). This domain incorporates quite rooted activities in the autonomous community, such as editing of books, newspapers and journals; news agencies; and translation and interpreting agencies. Advertisement is the second great area of the Catalan creativity in business volume (24.0%), but the first one in employment creation: it generates almost a quarter of all cultural occupation. The advertisement subsector is the only one, among the three leading CCS of Catalonia, having positive rates of compound growth during the 2008-2014 period, both in business volume, as well as employment and creation of companies. The third cultural and creative activity that more income produces in Catalonia is audiovisual: cinema, television, radio and increasing field of videogames contribute with 22.8% to the business of CCS. Activities grouped in Catalonia’s CCS are positioned third in business volume within the services sector of the autonomous community, after transport and hotels business, but clearly surpass real estate activities. The comparison with the hotel business evidences the economic potential of CCS: the activity generates 61.5% more employment, but only 32.5% of more incomes. That is, in strictly economic terms, the relative capacity of the business volume generation of every employee of the cultural sector almost doubles the one of an employee in the hotel business field. Although, as aforesaid, some institutions exclusively use business volume to measure the economic impact of CCI, others consider that it is adequate to complement this indicator with the gross value added. It is about an economic magnitude that measures the income generated by the group of producers within an economic area, the cultural and creative sectors in this project, therefore representing the values aggregated to goods and services in the different stages of the productive process. It is a statistic of special comparative usefulness, because it allows measuring the contribution of CCS to the national richness, expressed in GDP (macroeconomic dimension which is the sum of the gross value added of all companies in a country). The gross value added of CCS in Catalonia increases to 2.952 million Euros. The greatest contribution corresponds to the advertisement subsector (26.4%), followed by books and press (23.9%), and audiovisual and multimedia (18.4%). It is worth mentioning that advertisement, which is surpassed in almost six points by books and press in business volume, imposes with more than two points to this activity in gross value added, that is: advertisement contributes with more value than the editing activity from a lower sales number. The sum of contributions to the sector’s gross added value from the rest of cultural and creative activities represents less than a third of the total: visual arts,10.2%; architecture, 9.4%; performing arts, 7.2% and libraries, museums and patrimony, 4.4%. This last subsector’s case is peculiar because it generates within CCS an economic value that is greater than its business volume (4.4% against 1.6%). The reason is that the gross added value is calculated at basic prices, therefore including grants. Since said grants are quite important in the cultural field of libraries, museums and patrimony there is this differentiated behavior with a great presence of the public sector . From the 26.585 Euros that corresponds to each inhabitant in Catalonia as income per capita, 393 Euros come from culture and creativity. However, as a consequence of the decreasing behavior of the sector during the reference period, CCS has lost weight in Catalonia’s economy: if in 2008 the business volume represented 4.5% of GDP, in 2014 its contribution lowered to 3.7%. On its side, the contribution of cultural value added to GDP shifted, in the same period, from 2.0% to 1.5%. As average for all cultural and creative activities, the gross value added reduced a -5.5% between 2008 and 2014. This indicator has reduced mainly in the architecture activities (-14.4% per year, corresponding to 430 million Euros in absolute terms), in audiovisual and multimedia (-7.9% per year in average, that is, 349 million Euros less) and in books and press (-6.8%, which is translated into a reduction of 371 million Euros). 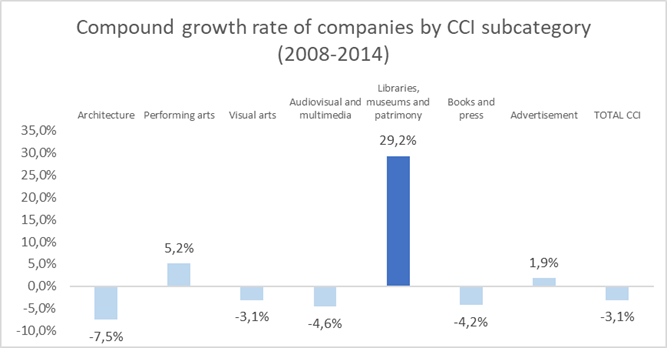 Other two subsectors record reductions of less amount: performing arts (-5.4%) and visual arts (-1.7%), while only two have a positive behavior: advertisement, that increases to an average of 1.8% annually; and libraries, museums and patrimony, with a 0.9%. The los of incomes in the books and press subcategory has a special impact in the sector’s economy, because it is about the activity that greater value adds to CCS in absolute terms: one of every four Euros. In contrast, advertisement, besides being the only one of the three large engines of CCS stablished in Catalonia that has created employment, this subgroup’s area is the one positioned best from recession, because it increases its invoicing in average and also adds further value to autonomic richness. As explained in the employment section, sector’s productivity (gross value added by employee) increases in Catalonia to 33.543 Euros for the total of CCS. It is the second best data among all autonomous communities, only surpassed by the Community of Madrid (48.383 euros). Even though productivity in Catalonia has decreased since 2008 with a mean of -2.4% annually, it has reduced at an inferior pace compared to the data comprising that indicator: with drops of -3.2% in employment and -5.5% in the gross value added, the employees of the cultural creative sector have maintained relatively more stable productive levels. 3.5. The attractiveness of CCS in Catalonia: policies and actions. As evidenced in the outcomes of the statistical model implemented by this project, Catalonia’s cultural and creative sectors occupy a relevant position in the Spanish scenario and are sustained in a socioeconomic context that favors the establishment of positive dynamics for its development. But in this case, additionally, the autonomous community has a series of institutions and policies that offer public support to the cultural field and try to configure it as a solid and structured sector. The official action in this field is articulated at several administrative levels. If we consider public cultural expense and the headcount volume, the main stakeholders are: local governments (represent 58.3% of expenses and 55.4% of public employment in cultural activities), the autonomic government of the Generalitat (28.3% and 33.7%, respectively), regional councils (11.1% and 9.6%), Spain’s government (1.6% of expenses) and county councils (0.6% and 1.3%) . The autonomic governments’ actions are in charge of the Culture Department, with their own competencies both in sector planning as well as lending services. The four general managements included therein, set forth their strategical lines: Archives, libraries, museums and patrimony; Creation and cultural companies; Popular culture, associationism and cultural actions; and linguistic policies. To implement their functions, the department has a series of specialized cultural entities: Catalan Agency of Cultural Patrimony, responsible for managing 38 monuments, five museums and a restoration center; the Catalan Institute of the Cultural Companies, dedicated to awarding grants and internationalization; the National Council of Culture and Arts, conceived to maintain promotion and expansion politics of culture despite government changes; Office of Support to the Cultural Initiative, sole window to process grands through electronic means; the Mediterranean Fair, an annual market for sales and purchase of performances of popular culture and music of the world; the Consortium for Linguistic Standardization, which main purpose is promoting the knowledge, use and dissemination of Catalan; the Institution of Catalan Letters, dedicated to protect and disseminate the literary Catalan patrimony; Institut Ramon Llull, which promotes studies of Catalan language and culture in the academic field abroad; and the Terminology Centre TERMCAT, responsible for the terminology standardization of Catalan. The organigram of affiliated entities is completed by the National Art Museum of Catalonia, Catalonia’s Library and the National Theater of Catalonia (Department of Culture, 2015 and 2017). The expenses approved by the Department of Culture and its entities surpasses the 255 million Euros, of which two thirds are targeted to grants for cultural activities. The expenses distribution by programs allows to identify the priorities of action: Museums, libraries, archives, archeology and patrimony receive 31.6% of resources; music, theater and dancing take 21.8%; linguistic standardization and letters, 17.4%; management and administration tasks represent 13.7% of expenses; cinema and video, 9.7%; visual arts 3.1%; and popular culture 2.6%. The culture department and its affiliated entities employ 2.320 individuals . To set forth the strategical lines of their cultural policies, the Catalan administration elaborates governing documents on a regular basis which must be implemented in the middle or long term. These guidelines may comprise the totality of the sector, such as the Strategic Plan of Culture 2011-2021, approved on December 2011, or complying with specific areas, such as the Museums Plan 2015-2025, Cultural Facility Plan 2010-2020, Digital culture plan for Catalan creative companies 2014-2016, Research plan of Catalan archeology and paleontology 2014-2017, National Reading Plan 2012-2016, Photography National Plan or action Plans for performing arts. Another one of the institutional factors that contribute to structure the cultural and creative sector in the Autonomous community is the interest of Catalonia’s Statistic Institute (IDESCAT) to delimit information in this field according to international criteria. On December 2014 the Institute published the first edition of Statistics and Balance Sheets of Cultural Companies (EMPCULT), which replaces the previous Satellite Account of the Culture of Catalonia and that is used as reference to delimit activities that are part of the cultural sector, the methodological works of the European Statistical System Network on Culture (ESSnet-Culture), promoted by the European Commission and Eurostat. Even though the original source for economic statistics of cultural and creative companies in the autonomous communities is the Annual Survey on Services of INE, its limitations make difficult to obtain data at territorial level . However, in Catalonia’s case, IDESCAT carried out, when designing its tabulation plan, an analysis of the evolution of the main economic indicators from which it can publish the most relevant macro-magnitudes of the cultural companies. IDESCAT data, as well as other autonomic and state sources, feed the periodic publication Cultural Statistics of Catalonia (Department of Culture, 2017), an annual inventory of the variables groups by cultural sectors and analytical functions (consumption, participation, expense) that allow to stablish a quantitative profile of the cultural reality in the autonomous community. Barcelona groups the greatest percentage of the autonomous community population (21%) and its local government concentrates almost a quarter of the public expense in culture from all Catalan local corporations (24%). Sector actions are responsibility of the Culture Institute of Barcelona (ICUB) and the design, assessment and monitoring of policies is responsibility of the Culture Council of Barcelona. The Municipal Action Program (PAM) 2016-2019 of the current administration, dedicates a chapter to culture, where there outstand among its strategic lines: to promote a balance between proximity culture and the one generated in the fields of the market and major facilities; to promote spaces where creators, scientific and digital communities and citizens collaborate in new models of innovation and accessibility to culture; and to ensure the presence of the cultural community in the areas of the municipal life (employment, commerce, innovation, tourism, international relationships, etc.) where the main strategic objectives of the future are determined. The writers of the document recognize that “Barcelona suffers an excess of cultural institutionalization that is manifested in an excess of public leading role in its cultural action as a whole” (Ajuntament de Barcelona, 2016: 97), and attribute to this reality, some of the problems that the city needs to face in the future: difficulties to connect activities emerging in neighborhoods and those that are manifested in the center or in major facilities; difficulties for contributing to improve the city’s touristic offer; difficulties to widen the social basis of cultural life; and difficulties to ensure a solid position in the cultural production of Barcelona in the international and State cultural map. The Libraries, museums and patrimony subsector is, as observed on graphic 8, the main recipient of municipal funds in Barcelona. Almost half of cultural budget executed in 2015, which increased to 125 million Euros, dedicated to this field. The city is also very active in the organization of cultural events: 743.542 individuals attended the nine major festivals of that year, with the leading role of Mercè Arts de Carrer (64% of total attendants), Festival de teatro GREC (12%) and Barcelona Acció Musical (10%). Stimulation policies for creativity and innovation are scheduled in the agenda of municipal authorities in large cities. In order to elaborate relevant clusters in this field, it is essential to have a media where creative and cultural sectors could nourish and Bloom. For some specialists in creative theory of the city, the creative environment, the social structure of creativity, and above all, the social, cultural and geographic context, are really vital for the effective integration of a urban-cultural policy (Sasaki, 2010). Some projects promoted by the local government of Barcelona point to this direction: the Dog Track- Park for Creative Research is specialized in the incubation of projects to guide entrepreneurs through the whole process of discovering and validation of the business model, construction of a feasible product and funding access; and Apps & Culture is a contest where the developments of applications for any device (computers, tablets or smartphones) is awarded, whereas they make citizen’s access to culture easier or that they help professionals of the creative and cultural industry to strengthen and better develop their activity. There are also private initiatives acting to potentiate a creative urban environment. For instance, Poblenou Urban District Association promotes this area of the city -el Poblenou- as the New District of Art and Creativity of Barcelona. The reason is powerful: there are last generation buildings, such as Agbar Tower or Disseny Hub Barcelona, with old warehouses, art galleries, foundations, design agencies, advertisement agencies, higher education centers, audiovisual produces, theaters, auditoriums, hotels and restaurants (Poblenou Urban District, 2017). The different public administrations have an active role in the display of cultural and creative sectors of Catalonia, either as direct protagonists or the cultural action or as active promoters of an appropriate environment for the development of these activities. Considering results of the present project confirm the existence of a positive correlation between the intensity of the cultural public expense and the corporate volume of the sector in the autonomous communities, it is appropriate to outstand the institutional support as one of the factors that explain the relevant weight of the Catalan cultural and creative sector in the context of Spanish autonomous communities. As seen, the socioeconomic context explains, to a great extent, the differences in the implantation of CCIs in the country and the presence of strong correlations between some of the essential variables for this activity in the Spanish autonomic context: GDP per capita and the high education level of the adult population feedback each other positively; education is also associated to a lower poverty risk rate and an elevated index of opportunities, infrastructures and digital uses; and this availability and intensive management of CIT is inherent to a greater cultural consumption and the enjoyment of favorable economic conditions. When considering the study variables of the Statistical Localcom Model of Cultural and Creative Industries (MELICC), we observe that these also have a positive correlation with GDP per capita, as dimension for social wellbeing. That is, as the CCIs employment levels increase (in % over the total employment rate of the Autonomous community), as well as CCIs companies per every 10 thousand inhabitants, CCI business volume (in % of the autonomic service sector) and gross added CCI value per employee, there is a proportional increase in the GDP per capita of the Autonomous community. In the interrelated dynamics of these virtuous circles, the territories that stand out in richness per capita, education level, opportunities, infrastructures and digital uses, cultural consumption and who have low levels of poverty risk, also registry the best results in the implantation of CCIs, in the employment rates in this field, in the business volume and they contribute with a greater added value at cultural and creative level to the autonomic richness. Cultural and creative sectors have the capacity to transform into outstanding factors of autonomic development due to its potential impact on economy and society, It is about fields that directly act in two places: 1) social, that is, about cohesion, integration, construction of new values, the emergence of talent, excellence, diversity and innovation; and 2) in the economic place, where it is demonstrated that the four study variables of the model used have a positive correlation with the gross domestic product per capita, as a dimension of social wellbeing. In sum, as levels of sector occupations increase (in percentage of the total employment in the autonomous community), the number of companies of CCS by every 10 thousand inhabitants, the business volume in this field (in percentage of autonomic services sector) and the gross value added per employee, there is a proportional increase in the GDP per capita of the autonomous community. In this sense, CCIs of Catalonia occupy a relevant position in Spain as a country since cultural and creative sectors contribute with outstanding comparative intensity to the GDP, the gross value added and employment, which makes us specially competitive at autonomic level. Finally, the definition and implantation of specific policies in culture and creativity by Spanish autonomous communities, unveils as the only option to transform imbalances observed in the research into virtuous circles, in correspondence with the European Strategy Horizon 2020. This paper is a contribution of the project CSO2013-42822R “The transformation of cultural and creative industries in Spain: digital change, competitiveness, employment and contribution to social wellbeing in the Horizon 2020”, funded by the Ministry of Economy and Competitiveness, and developed, under the management of Marcial Murciano, by the Localcom research group in the framework of R+D+i National Plan 2013-2017. Data of 2014, which correspond to the last update of the Model performed with data of the Annual Survey on Services by INE, published on June 17, 2016, and Statistics and Balance Sheets of Cultural Companies of IDESCAT, published on October 4, 2016.
 International studies use this relationship between the CCI and GDP. For instance, for Europe in 2013, 709 billion $ of CCI income, represent 3% of GDP in the continent (E&Y, 2015: 17). According to the source of reference (Annual Survey on Services by INE), “It is considered staff employees (occupied) to the individuals that contribute, through their work, to the production of goods and services, or who perform assistant tasks in the company, either remunerated or not”. (INE, 2015: 10). The INE considers company to “every organizational unit of goods and services production, that enjoys a certain autonomy of decision, mainly when it comes to use the ordinary resources available” (INE, 2015: 4). However, the category used in disaggregated data by autonomous communities is the number of facilities, that “corresponds with a company or a part of the company (workshop, factory, warehouse, offices, deposit) locates in a topographically delimited place.” (INE, 2015: 11). On the other hand, IDESCAT (2017), bases its statistics EMPCULT (used as reference in the reassignment of data from the MELICC model), in the number of companies which main economic activity belongs to the culture sector according to the stablished delimitation. This atypical behavior detected in libraries, museums and archives corresponds with INE’s original data used as reference for the subcategory. For the imputation of missing data from the variable called ‘Number of companies’ in this subcategory. To assign the missing data of the variable ‘Number of companies’ in this subcategory, we used the statistics of the Central Company Directory (DIRCE) by INE, that show an average increase for Spain in general of 150% in the number of companies between 2009 and 2010. In some autonomous communities, the registries identified by INE in said tax year are particularly eye-catching: 365% in Castile and Leon or 303% in Madrid. The increase detected by INE during that year for Catalonia, of 235%, conditions the behavior of the complete period and explains the elevated compound growth of the number of companies grouped in the subsector of libraries, museums and patrimony. We need to specify that as response to a project’s consultation about the inclusion or not of activities of the public sector in the Annual Survey on Services, the Promoting Unit of INE responsible of this statistic, states that: “Annual surveys are not targeted to sectors in particular; the sample has been selected by activities that are part of this survey’s area, among other variables, therefore, if the activity was part of our area, we would consider it as well.” (NC075/2017, dated February 23, 2017). Ajuntament de Barcelona (2016). Programa de Actuación Municipal (PAM) 2016-2019. Barcelona: Ayuntament de Barcelona. Bustamante, Enrique (ed.) (2011). Industrias creativas. Barcelona: Gedisa. Bustamante, Enrique y Rueda, Fernando (Coords.) (2015): Informe sobre el estado de la cultura en España, la salida digital [ICE-2014]. Madrid: Fundación Alternativas. Comisión Europea (2011b). Horizonte 2020, Programa Marco de Investigación e Innovación. COM(2011) 808 final. Bruselas: Comisión Europea. Departament de Cultura (2014). Plan de cultura digital para las empresas creativas catalanas 2014-2016. Barcelona: Generalitat de Catalunya. Departament de Cultura (2015). Balanç de Govern, Departament de Cultura 2011/2015. Dades pressupostàries. Barcelona: Generalitat de Catalunya. Departament de Cultura (2017). Estadístiques culturals de Catalunya 2017. Barcelona: Generalitat de Catalunya. Departament de Cultura (2017). Pressupost del Departament de Cultura Projecte 2017. Barcelona: Generalitat de Catalunya. Department for Culture, Media and Sports (2011). Creative Industries Economic Estimates. Full Statistical Release. London: DCMS. ESSnet‐CULTURE and European Commission, Eurostat (2012): European Statistical System Network on Culture FINAL REPORT. Luxembourgo: ESSnet‐CULTURE/ Eurostat. Eurostat (2014). Cultural statistics. Luxembourgo: Publications Office of the European Union. Eurostat (2016). Cultural statistics. Luxembourgo: Publications Office of the European Union. Instituto Nacional de Estadística (2015): Encuesta Anual de Servicios: Notas metodológicas. Madrid: INE. KEA European Affairs (2006): The Economy of Culture in Europe, Brussels: European Commission. Ministerio de de Educación, Cultura y Deportes (2017). Plan Cultura 2020. Madrid: MECD. Ministerio de Educación, Cultura y Deporte (2016). Anuario de Estadísticas culturales. Madrid: MECD. Ministerio de Educación, Cultura y Deporte (2016). Las cifras de la educación en España. Estadísticas e indicadores. Madrid: MECD. Ministerio de Educaciuón, Cultura y Deporte (2010-2015). Cuenta Satélite de la cultura en España. Base 2010. Madrid: MECD. Parlamento Europeo (2013). Reglamento n.º 1295/2013 del Parlamento Europeo y del Consejo, de 11 de diciembre de 2013, por el que se establece el Programa Europa Creativa (2014-2020). Estrasburgo: Diario Oficial de la Unión Europea. Sasaki, Masayuki (2010). “Urban regeneration through cultural creativity and social inclusion: Rethinking creative city theory through a Japanese case study”. En Cities Vol. 27, Supplement 1, June 2010, pp. S3–S9. UNESCO (2012). Measuring the economic contribution of cultural industries. Montreal: UNESCO. Verón-Lassa, J.J., Zugasti-Azagra, R., y Sabés-Turmo, F. (2017): “La incidencia de la crisis económica en las industrias culturales y creativas: el caso de Aragón (2008-2013)”. Revista Latina de Comunicación Social, 72, pp. 26 a 46. Article received on 3 December 2017. Accepted on 24 January.